Pennsylvania has the third-highest number of state-maintained bridges in the country, with nearly 25,400. The average age of those bridges is more than 50 years old. 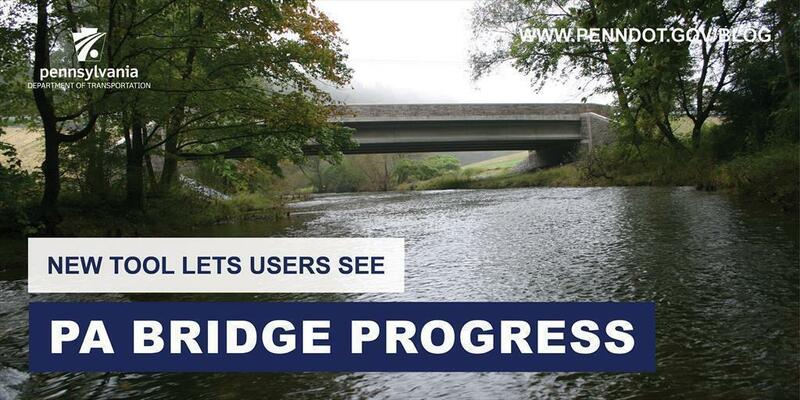 But we’re glad to report that since January 2015, there are 819 more state-maintained bridges in good condition. Additionally, the number in poor condition has dropped by 1,044. "Our roadways receive a lot of attention, but the safety of our bridges is also crucial to keeping goods and people moving in our communities," PennDOT Secretary Leslie S. Richards said in a recent press release. "We have many, very old bridges and we are doing everything we can to replace bridges when needed, while maintaining and preserving others to extend their useful life." Though the department has long maintained quarterly updates on state bridges condition on our website, we’ve recently introduced a new Bridge Conditions map on the PennDOT Projects website. This interactive map allows users to easily view conditions of state and local bridges in your community. Bridges are rated as good (green), fair (orange), or poor (red), and you can filter the map by county, PennDOT district, legislative district, or planning partner area. To discover other ways PennDOT is delivering results that improve your mobility and quality of life, visit our Performance Results page.